Once again the Rugby Memorabilia Society has the privilege of sharing items from the Philip Dudley Waller collection. This time we have the Honours Caps presented to Phil Waller during his illustrious playing career. (If anyone knows of the location of this please get in touch). Newport provided a record seven members for the 1910 British 'Lions' touring team to South Africa, which was Captained by another Newport player in Ireland's Tommy Smyth. Waller featured in all 3 Tests against South Africa including the 2nd Test victory 8-3. Waller would of been presented this Cap after making his Wales debut in the international against Australia in 1908. 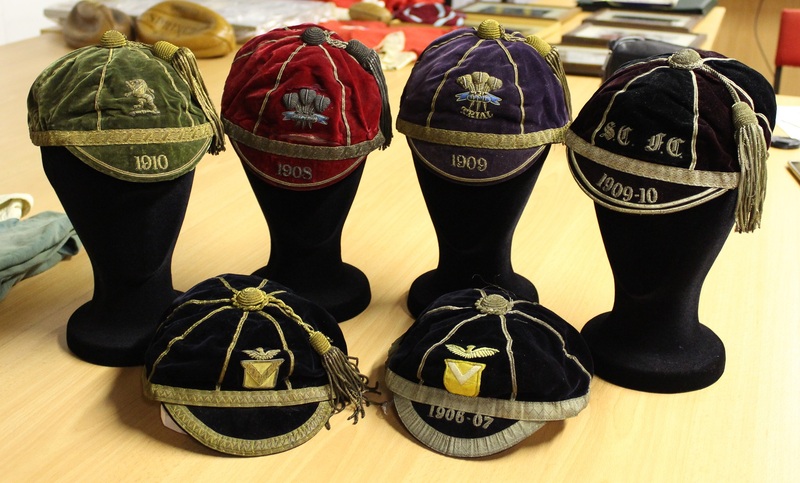 With the date of 1909 on the Cap, This would signify Waller made his Welsh debut before appearing in a Trials match. Unless there was another Trials match earlier in the year, then one would presume he was awarded this Cap after the Trials match on December 1st 1909 at Cardiff Arms Park. Waller represented the whites against the stripes and in the match report was descried as ‘the best of the Whites eight’. Phil Waller was born in Bath on 28th January 1889 and represented his county of birth. (if anyone has any further information relating to the county matches Waller played for Somerset please get in touch).